The ASUS K501UW-AB78 is a gaming laptop with a premium processor and SSD storage to provide the user with a lightning fast gaming experience that doesn’t skimp on graphics quality in the process. The Intel Core i7-6500U is a member of the processor family that’s still commonly referred to by its old codename, Skylake. It’s a sophisticated processor that has a base processor frequency of 2.50Ghz and a max turbo frequency of 3.10Ghz. It comes with a 4MB SmartCache, which allows the cores to access the processor’s cache more efficiently. The processor’s graphics are Intel HD Graphics 520, which supports DirectX 12 as well as the much gamer-coveted 4K resolution. 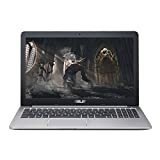 It’s essentially a very good choice in processor for a gaming laptop because it’s fast and has the rich specs to keep up with modern gaming. The GTX 960M graphics card and other graphics cards in that GeForce family are extremely popular choices when it comes to gaming laptops graphics cards, because they’re made specifically for gaming laptops. They optimize the laptop’s performance while you game in a variety of ways, such as: improving battery life while gaming unplugged via BatteryBoost; allowing for 4K graphics via Dynamic Super Resolution (DSR) technology; and safely overclocking your GPU with GPU Boost 2.0. Another cool feature is NVIDIA’s Optimus technology; it runs in the background, interchanging the GTX 960M graphics card and the Intel Integrated Graphics, depending on which applications you’re running. This allows your battery to last longer and optimizes energy and RAM efficiency at the same time. 8GB RAM is pretty standard for gaming laptops, because most current games recommend 8GB RAM for good performance. Some games post 8GB as their minimum requirements. This isn’t that common now, but will become more and more so with each passing year, which is why it’s a smart idea to go with 8GB or more if you’re a gamer. SSD storage is a newer type of storage than traditional spinning disc hard drives. It works more like the chips in thumb drives which means it’s: A) physically sturdier and B) works faster. Because it’s more durable than a hard drive disc, you don’t have to worry about it cracking and becoming inoperable to the extent you do a traditional hard drive. And because it’s faster, it boots your PC and loads games far quicker than an HDD drive does. The one downside of SSD storage is that it’s so new it’s still on the expensive side and costs more per gigabyte than HDD storage. However, the 512GB that come with the ASUS K501UW-AB78 is a lot more storage than most mid-range SSD drives currently have, making this a great choice for someone who wants the durability and speed of SSD without sacrificing space. After all, more and more games are requiring tens of gigabytes of free space just to install the base game without expansions, so it’s smart to keep that in mind when thinking about storage. The matte FHD display is 15.6 inches and has a resolution of 1920×1080, making it ideal for most HD gaming needs. The intelligent Smart Gesture technology on the ASUS gaming laptop makes for a more organic touch pad experience. An unresponsive touch pad is a buzz killer in the world of gaming, so this is actually a really important feature that shouldn’t be overlooked. There are two main benefits to Windows 10 for gamers. The most obvious one is Xbox integration, so you can connect your Xbox one for a cross-platform gaming experience, as well as stream and other cool stuff. The other great thing about Windows 10 from a gaming perspective is the Smart Menu. The importance of the smart menu can’t be overstated, because most long-time modders hated the lack of Start Menu in Windows 8, because it conflicted with the muscle memory they have for accessing game files quickly. And if you’re upgrading from a really, really old version of Windows, you’ll notice a few other nifty features, like being able to pin certain programs to the task bar for easy access. This is great for gamers, because you can quickly access your favorite games with a simple click. This laptop comes with 802.11ac Wi-Fi, which offers the fastest Wi-Fi connectivity to date, far outpacing its predecessor, the similarly-named 802.11n. The K501UW-AB78 comes with a slew of ports and connections, namely: two USB 2.0 ports, two USB 3.0 ports, one headphone-out-audio-in combo jack, one LAN jack, one HDMI port and a card reader. Basically, you will always have a place to put something with this gaming laptop, which isn’t as weird as it sounds. ASUS’s SonicMaster technology is a combination of tuning, hardware and software to provide you with a professional sound, capable of loud volume for an immersive audio experience during gaming. It also has features that reduce noise and other sound impurities, keeping your audio clean and perfect. ASUS IceCool Technology is essentially an intelligently configured layout to keep the surface of the laptop cool while you game, so your hands don’t get smart. It’s simple, but appreciated. On the more technical side of things, the CPU and GPU each have their own copper fan that whisks hot hair out of the system and keeps your vulnerable components nice and frosty. The laptop comes with an AC adaptor so you can charge the battery, the lithium-ion battery itself, a user e-manual and a warranty card. Also, Windows 10 comes preinstalled, along with Cortana, depending where you live. Every gamer wants to know if a graphics card will run their favorite games. And while we can’t do an exhaustive list here, I will list a small selection of current and/or popular titles that can be run smoothly on ultra and high settings. For those wondering whether or not you can play The Witcher III, yes you can. You will have to go for medium or customized lower settings unless you’re okay with lag, but it is playable. And remember: The graphics card isn’t the only variable when it comes to whether or not a game will run on your system. You also need to make sure you meet the RAM requirements (preferably the RAM recommendations) and that you have enough storage space to hold the game and any custom content or mods you might want. Ideally, you’ll have enough space for expansion packs and other games, so keep that in mind, too. The K501US-AB78 gaming laptop comes with one year of ASUS Accidental Damage Protection. In general, things you accidentally do that destroy your computer aren’t covered under warranty, so this is a nice extra bit of protection. The battery is also protected for a year, while the warranty info for the rest of the laptop will come with it and may be rendered in months, so some math might be required. As always, read the fine print to get the best out of your warranty and keep your proof of purchase, because typically, if you don’t, they will assume it’s the manufacture date and you cut could your warranty off entirely that way just because you didn’t keep the proof of purchase. In other words, be smart. 8GB RAM: Some may prefer more RAM, like 16GB, but 8GB is still considered sufficient for most gamers. The ASUS K501UW-AB78 15.6-inch gaming laptop is one that I would recommend to any gamer looking for a sleek, nice-looking, portable gaming laptop that is still powerful enough to play the games you want to play and do the things you want to do. A big factor into why it’s so sweet is its powerful processor which plays nicely with the NVIDIA GeForce GTX 960M graphics. The visual experience is vivid and lush while ASUS’s SmartSonic technology allows for clean audio that sounds great whether you like your sound whisper-quiet or arena loud. Bottom line: It runs smooth, it’s powerful, it looks good, and the SSD storage is the icing on the already yummy gaming laptop cake.